Math games for preschoolers allow children to build skills and gain confidence while having fun. Read on for types of games and tips! As with most numeric, logic, and math concepts, a solid grasp of fundamentals is important before trying to proceed to more advanced concepts. Before a preschooler can count by fives, for example, he or she should be able to count fluently. Today there are a vast number of resources for teaching math through fun and games to preschooler - from printable logic puzzles and math worksheets on the Internet to fun math-based board and group games. Teachers and parents can also make up preschool games for young children with little or not cost and only minimal effort. Use a child's natural inquisitiveness to challenge him or her in understanding numeric or other concepts. 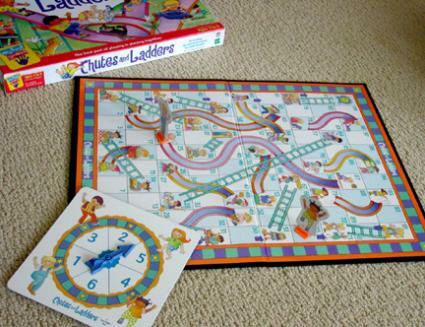 Chutes and Ladders builds counting skills. Whether in the preschool classroom or at home with Mom and Dad, math-based board games for preschoolers can be fun for everyone. You can purchase kids' math games at select department stores, educational or teacher supply stores, and online at retailers like Fat Brain Toys and Amazon.com. Muggins Math Games: Winner of several awards, these sturdy games can be used to facilitate a number of math concepts for ages 4 and up. Mighty Mind: Winner of the Parent's Choice Award, this game is for ages 3-6 and builds skills related to counting, categorizing. spatial relationships, and more. Thomas & Friends Number Game: A Best Toy Award winner, this preschool math game is for ages 3 and up and enforces counting skills, matching, and can be modified to build addition skills for more advanced players. I Know It.com: Offers pre-kindergarten online math games that build skills in counting, place value, shape and geometrical recognition, and more. PBS Kids' Games: Browse the games at the PBS Kids site for measuring, counting, puzzle, shape, and other games that offer fundamental math skills - based on the characters your preschooler loves! Kitchen Counting: When you're busy in the kitchen, get a basket or container and place a number of different kitchen objects inside, such as measuring cups, mixing spoons, and lids. Have your child count the objects and sort them into piles with the like items. Find the Shapes: Armed with a piece of a paper and crayon, have your preschooler find, count, and draw shapes from around the room. 3-D Graph Game: Using colored wooden blocks, first a have your child sort the blocks into color families. Next choose several groups of similar household items - these could be types of stuffed animals, types of fruit in the fruit bowl, silverware from the drawer - you name it. Have your child create a 3-dimensional 'graph' by using a block for each item, and different colored blocks for items for the different items in the group (blue blocks for stuffed bears, green blocks for stuffed monkeys, etc.). Using your imagination and some everyday objects, you can easily come up with games that will help teach your little one some math fundamentals. Whether you're creating your own games or using an online or store-bought version, remember to challenge the child, but be aware if he or she starts to seem overwhelmed. Progress from easier to more difficult concepts to give the child confidence and build solid skill sets. Above all, remember to make it fun!